-Aunt Nena´s Green Apple Explosion in the 20W hot plate warmer in the first floor. I am not having the best luck with Aunt Nena´s. A few tarts were good but the majority has no throw. Just like this one! I got no scent out of this! -Sugar & Spice Gourmet Blueberry Cobbler in the kitchen in a tealight warmer. I didn´t care for this slightly fruity scent, it was a bit sweet and just blah. Throw was ok though I think S&SG should be melted in a hot plate! -Three Sisters Soap Autumn Afternoon in my 24W hot plate in the living room. Now this was the one tart I really loved (I knew I love it though as it wasn´t the first time melting one of these). It´s a really good fall scent, slightly crisp and not spicy. 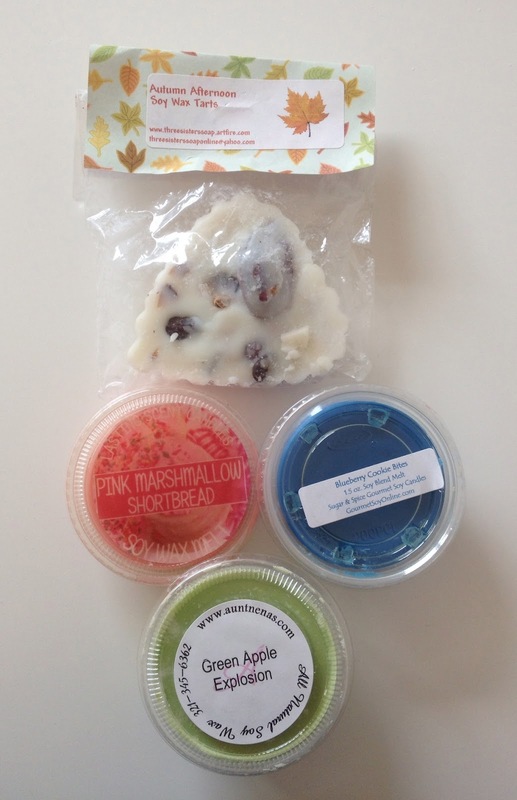 I really love the scent and the embedded dried fruits and leaves look pretty in the molten wax! -Lasting Scent Candles Pink Marshmallow Shortbread in my Whoot warmer in the living room. This had zero throw though I want to blame it on the warmer which just doesn´t seem to work well with anything except for scentsy (and even those I prefer them in one of my handmade bunny bulb warmers!). The scent is gorgeous! A gooey smooth marshmallow bakery scent!